There are two notable reprints coming up in November: Munchkin Impossible and Munchkin Zombie Deluxe. 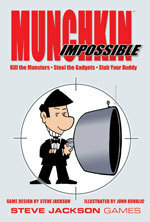 Munchkin Impossible has been completely out-of-print and is finally back. 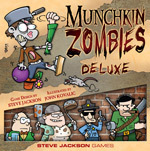 Munchkin Zombie Deluxe is now arriving in hobby stores. As always, this set is stand-alone, but can be combined with other Munchkin game. Vampire spies? Russian dwarves? Go crazy! If you have friends who have never played dungeon adventures, the spy theme will let you hook them on Munchkin. Enough gadgets to make any movie spy envious! What makes this edition "deluxe"? It's got a big gameboard to keep your cards in place, and colored standies that you move on the gameboard as you level up! This edition of Munchkin Zombies includes 12 zombie standies (male and female in six colors) and a Level track, to make SURE you know who's out in front! Steve Jackson's macabre card ideas and John Kovalic's disgusting art . . . what more do you need to know?